Our family met Amanda Evans in early June 2013. We had just returned home from a vacation during which we lost our beloved 8 year old Irish Setter, Brody to complications with his diabetes while we were away and he was with a pet sitter. We were absolutely RUINED emotionally and while we couldn’t imagine how life was ever going to be the same again, I wanted to contact a reputable breeder to ask if we could be placed on a “wish list” for a future puppy. To our amazement and joy, when we called Amanda, she had just decided to move a female puppy to a home in addition to having a male coming available in another couple of weeks. While we didn’t know if we were ready to replace our beloved boy, we made the trip over to Amanda’s to see the babies. We were immediately impressed with not only those GORGEOUS puppies, her other setters at the house, and especially Amanda! She obviously loved these dogs, and this was WAY beyond a business for her, and it showed in her interaction with the dogs and their temperments. Well, we fell in LOVE with the little girl and took her home that night. Our life has been changed ever since! This little girl filled the hole in our hearts, and having Amanda as the breeder made the experience SO special. It had been a LONG time since we had had a baby puppy in the house, and we were definatey out of practice. Amanda provided LOTS of guidance when we left her house, and was very organized for puppy adoptions, having a packet ready with all we needed to know about food, immunizations, puppy stages, AKC registration docs, etc. etc. We were VERY impressed and even more so the longer I knew Amanda and learned that she was a relatively new breeder. You never would have know it, because she was an AMAZING partner in the process and that partnership did not end when we walked away. I called Amanda on several occasions throughout this last year and a half to ask questions that came up about lots of things that came up in raising our beautiful little girl, and she ALWAYS made herself available to me. She even gave Thea some gifts along our path which we absolutely LOVE! I am not a Facebook user, but there is just one person I keep in touch with on Facebook, and that is Amanda. I love the additional connection with her, the pictures of her gorgeous setters that she posts, and seeing the love that she has of her dogs warms the hearts of our family. As if the relationship with Amanda in raising our girl, Thea that we adopted from her wasn’t enough, I reached out to Amanda when we wanted to get a second puppy, and she did not just give me names of who to call, but made calls FOR me! Who does that?? She called and gave us a personal reference which made the complete difference in us being chosen by that breeder to adopt our next beloved baby, a boy. I can’t say enough great things about Amanda Evans as a breeder. She is not only our breeder, but is also hopefully a new friend for life as well as a result of our Irish Setter connection. We searched for months for the perfect little Irish girl to add to our family. During the months of our search, our 12 year old fur baby, Alex, was diagnosed with Liver Cancer. We wanted Alex to meet his new sister and hopefully share with her, some of his clown like, goofy behavior. A friend connected us with Amanda Evans shortly after the Classic Hollywood Movie Litter was born. It was, love at first sight…her name would be Jasmine! Amanda, kept us updated with photos and phone calls until Jasmine was old enough to ship. The day we picked Jasmine up from the Atlanta Airport was one of the happiest days of my life! We had waited for so long…AND THE DAY WAS FINALLY HERE!!! I was like a kid on Christmas morning! We got to the airport an hour before her plane was scheduled to land. That was the longest hour!!!! We were notified as soon as the plane landed and directed to the luggage holding area. Shortly after ariving, Jasmine was carted over to us in her shipping crate. We opened the crate and was immediately greeted with kisses and a wagging tail! She was perfect and exactly what we needed…”our little ray of sunshine”, which became one of our nicknames for her! We had a 5 1/2 hour ride back home. When we got home, we were greeted at the door by our sweet boy, Alex. At first he didn’t know what to do with this little red jumping bean, but as the days went by they became best buds! Alex even taught Jasmine some of his witty ways just as we had hoped for! Jasmine is a very affectionate, sweet girl with an excellent temperament. We could not be any happier with our choice in breeders! Amanda has always been there to answer any of our questions. We stay in contact and I share lots of photos and videos of Jasmine. Because of Jasmine’s sweet and affectionate temperament and her laid-back personality, we are in the beginning stages of getting her, CGC and Therapy Dog International Certifications. A huge THANK YOU to Amanda Evans for entrusting us with this precious “little ray of sunshine”! I purchased our beloved Irish Setter Sarah from Amanda Evans three years ago after the untimely and tragic loss of our Irish Setter, Connor. Having raised show and field Irish most of my life I wanted to reach out to a breeder who had studied pedigrees and understood the importance of researching before breeding to not only ensure the “wins” but also ensure healthy, happy and sound puppies. Amanda worked with me every step of the way through phone calls, emails and several pictures of Sarah until she was old enough for me to pick up. I flew to Denver where I was met by Sarah and Amanda at the airport. Sarah came complete with a health certificate from a qualified veterinarian, micro chipped, all first shots, toys, collar and leash. She came with a full money back guarantee. Amanda has continued to offer support of any questions that have arisen over the last few years in regards to Sarah. I have received all Sarah’s AKC registration and pedigree as well. Sarah exemplifies every quality that we expect when owning an Irish Setter. She has a rollicking personality, loves to run, loves children and she is a faithful and Loyal Companion. She remains healthy and sound and we expect many happy years with her in our lives. 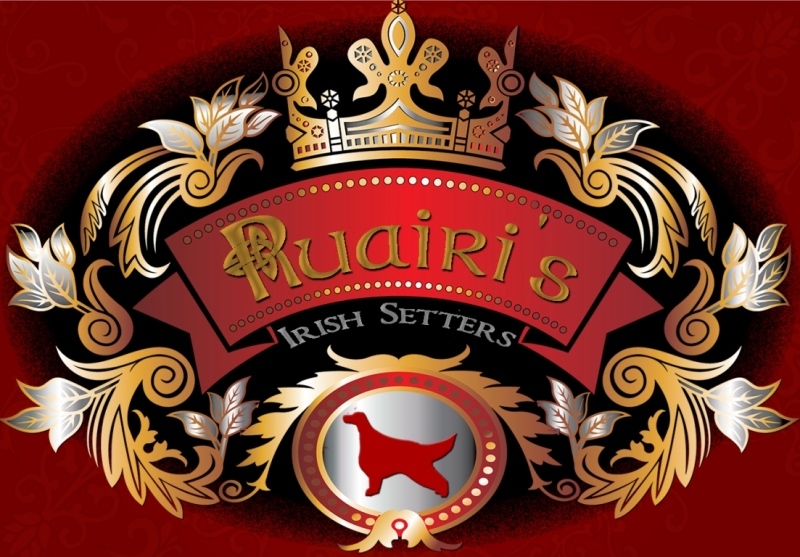 I would highly recommend Ruairi Kennels to anyone who is in search of buying not only a potential champion Irish setter but also a guaranteed loving, healthy companion dog. On October 1, 2011 I received a call from a dear friend and respected Irish setter breeder. My friend simply said, “I found a dog for you. Call this number NOW!” That phone call was the introduction into an incredible relationship with yet another wonderful person and outstanding breeder. That was the day I first spoke to Amanda Evans. I was the first person to call her regarding a new litter of puppies born that very day. The litter was never announced to the “Irish” world. That in itself seldom happens. Lo and behold I got first pick. I immediately sent a deposit in the full amount and looked forward to receiving an Irish blessing around Christmas time. One of the first things telling me what a magnificent breeder Amanda is that I learned she could have driven her pregnant girl 2,000 miles to her Florida home but decided to stay in Colorado at the beginning of fall and winter rather than take the chance of causing a problem for the little mother. On a snowy Christmas Day I drove to Denver and the next morning I drove to her home where I chose the Irish boy known now as “Dillon”. He was, “Blue Boy” then. I remember Amanda walking me to my Jeep holding this little boy. She loved every dog in the litter. Well three years has now passed and I have continued to learn about the dedication of this lady to do her part to improve this magnificent breed. She not only has an “Eye” for a good looking dog. She also does a huge amount of research as she looks at pedigrees to determine the medical history, personality tendencies, and other traits which might contribute to negative outcomes of a breeding. She always strives for perfection. There are many breeders who will breed a dog more than twice. This is not a good thing to do and Amanda knows it and will not prescribe to such tactics in pursuit of another dollar. There are breeders who breed for money and nothing could be farther from the truth with Amanda Evans. I have seldom seen her angry but the angriest I have ever seen her has been when someone is taking advantage of a dog either in their breeding practices or how an individual is mistreating a dog whether it is from one of her breeding’s or not. I could go on and on about Amanda Evans and how she is not only a great and knowledgeable breeder, but she is also a good and loving person. She takes her responsibility as a breeder and person to another level and has even allowed some people to take advantage of her in an effort to be, “More Than Fair”. I am so blessed to have been referred to Amanda Evans and Rauairi’s Irish Setters, I will be eternally grateful. If you are looking for an Irish, contact her, trust her, and you will be blessed because of it. I have and look forward to yet another unbelievable puppy in the future from Amanda Evans and Rauairi’s Irish Setters.